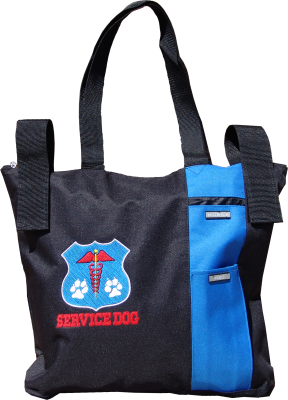 The Service Dog or Therapy Dog Zip Top Tote's exterior is made of nylon/PVC backed fabric. The interior of the bag can be easily wiped clean. The tote has two pockets on the exterior--one for a water bottle and another for your cell phone. The tote zips shut and also has a 2” wide Hook and Loop strap along the top edge (on each side) so it can be attached to a rail, chair arm, walker, or wheelchair. The tote's handles are long enough to be worn over the shoulder. High sheen, polyester embroidery threads are used in the detailed graphics on the tote. We will personalize the tote for you. You can have your name, your dog's name or another text above the embroidered graphic. You can choose Service Dog, Therapy Dog, or no graphic (all with or without personalization).